On 22 March I was reading the supplements in the press over World Water Day. In Sri Lanka it is a matter of pride that in this particular day we can reminisce and claim on our proud hydraulic heritage and even coming to the recent times declare of our own total control of Gal Oya scheme in design and construction – seven times the capacity of Parakrama Samudraya! However on 23 March I was witnessing a deluge of water from a hosepipe on a vehicle and someone scrubbing vigorously the body in trying to get some shine. The previous day’s reading and discussions reminded me that we actually enjoy our pipe-borne water at a subsidised rate. The Water Board spends about Rs. 48 on average for a cubic meter of purified water while at the basic level we only pay Rs. 12 per unit. All the chemicals we have to import and sometimes even food grade chemicals are used for water purification. Then we liberally used this purified supply to wash vehicles without an iota of understanding. This lack of sensitivity is seen across many a function. As you see in the picture in some places a child for his shower only has a choice that all of us would find quite revolting! Most certainly water is life. However, today we find the resource really stressed and most of the reasons we should be able to trace back to our actions. As this year’s Water Day is celebrated, the world’s first situation of a major urban city running out of water is taking place in Cape Town, South Africa. This developed city of six million people a Day Zero – the day when the pipes will run dry – is a haunting reality and the dates are just getting extended only because the city’s tough action on continuous reduction of what is being made available. A long-standing drought has reduced the available water in the reservoir and earlier Day Zero was estimated to happen in April which now had been postponed to July. This is basically by further rationing the water to its citizen’s from 100 litres to 50 litres per person per day. Considering that this city is a thriving metropolis with a significant tourist inflow, one can understand when you can now only have a two-minute shower, one toilet flush, two hand-washings, etc. This is indeed an extreme situation but the reality is that it is not the only city that is facing this situation – yes, that is the most significant. Recently research published in Nature reported that 19% of 482 cities studied are to be susceptible to severe water stress. We must admit that we are quite reckless with the handling of this resource. Though with the past glory as a hydraulic civilisation, which designed and developed world-class hydraulic infrastructure, today we are at times reduced to sending water in bottles to the very same places. This is indeed sad! However, whether we see the irony of the situation, I am not sure as we feel as if it is mission accomplished when the lorry loads appear and get distributed with all the associated banners and event management teams on site. Just consider how much of a backward journey we have travelled since then. Again the very same region is plagued with a disease of unknown origin and one clear alleviating solution has been the provision of clean drinking water. This really should not be considered as a solution but more as a basic human right. Again, all the systems that have been identified as the best interim measure of water delivery is coming from a technology sourced from elsewhere and which has inherent complexities and costly maintenance duty attached. Can’t we provide water with a different mechanism? There are rainwater harvesting systems too being deployed but the support and the scale of deployment is much less and of course they directly depend on rain being available and today we have witnessed a long period of drought in most parts of that region. We are the world’s No. 1 supplier of activated carbon based on a renewable resource. It beats me why we cannot engage and design community water supply schemes, as activated carbon is an excellent purification media. With RO it is indeed sad to witness the retained water portion which can be up to two-thirds of the water intake and which should potentially contain all the toxins that should be causing the kidney disease being just poured into the ground again. This is a common sight and an incredibly questionable procedure. One must understand if there are no significant levels of toxins in the discharge water, then actually the use of RO is an overkill. Thus with respect to managing a resource technical understanding with lifecycle analysis is most important. Also a question to be asked is, can a farmer carry a bottle with built in purification potential thus allowing him to use from any source of water, relieving him of anxiety and dehydrating due to fear and in addition creating additional oxidative stress? The region, which we used in picture postcards and earn tourist dollars, is in real need of a technical solution today to realise a basic human right. Giving leadership to the provision of a resource supply also needs an in-depth understanding. It just cannot be achieved with ad-hoc decision-making or with different agendas. Before Cape Town, Melbourne – a city with so many Sri Lankans – who have decided to leave a wet country to seek abode in a drier country – faced a serious water crisis due to the drought between 1997 and 2007. The authorities did communicate on a daily basis the available water and did indicate explicitly the need to conserve and the citizen’s did. While the citizenry changed their water devices to be more frugal with the dispensation – taking the responsibility to shower for a minimum time period with a low quantity of water, gardening to be controlled, etc. – design and development work too were integrated to ensure that acceptance of the new way of life was not going to be difficult. In houses you may find two water supply lines fresh and reclaimed water from recycling operations being made available to certain tasks – toilet flushing to cleaning tasks, rain water harvesting systems built in, etc. One significant threat under which we live today is climate change. One can attribute this threat to our own making but as Sri Lankans we only will be in the receiving end of impacts. Water is considered to be the one which is most susceptible under climate change and risks to that resource the greatest. 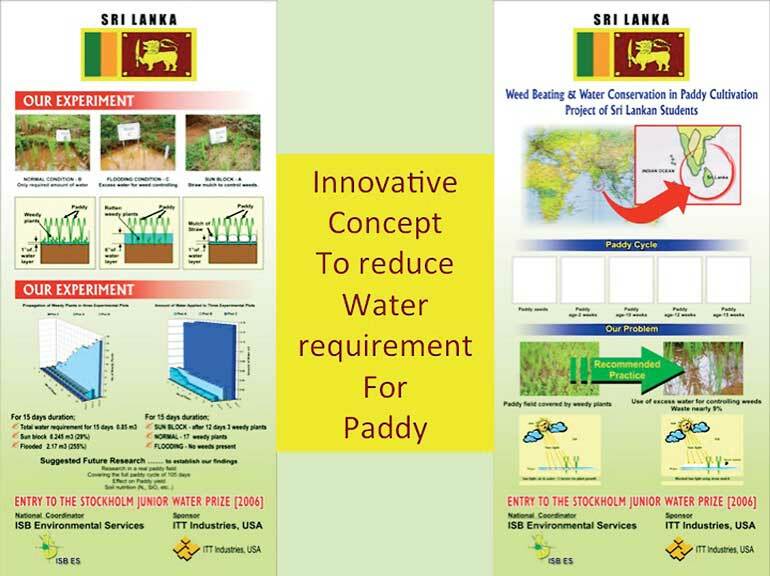 Even when sending water to Anuradhapura and then when floods inundate the very same lands, when seawater intrusion at Kelani and Kalu Ganga appears not many are moving us to concrete action in a planned manner. Water is too great a resource to be considered only as a political measure and interest should not be restricted only to be correlated to the potential impact on the elections. While Melbourne demonstrated how decision makers should act bringing along with them the citizen’s to work as one we revel in finding solutions first getting ourselves completely divided! While one conserve there may actually be another who will ready to burn the infrastructure in protest over perceived rights! So many downside risks that our water economic sector has, we should understand the value of efforts of conservation to innovations. Efforts should be made with Public Private Partnerships. Just consider the array of devices that are coming into the market for water efficiency in other countries. Some just do not conserve they communicate conservation as typical of this IoT (Internet of Things) age. I am not recommending simply buying all these from outside but recommending understanding the business potential too that one can realise by engaging in such activities. Today we experience that one single flood, a deluge of about 125mm rainfall, can cause a dip in economic performance of the nation for that particular quarter. Where is the resilience? There is the need to address and build resilience as unfortunately extreme events are much more likely to be the norm than a rarity in time to come. There is also the need to connect research with applications to realise benefits and this is important to water sector as well. As the example provided indicates, we have been ignorant of much of successes realised on the international stage for common benefit. As a nation that has innovated in the past to the level of global excellence, the time calls for a similar resurgence of the ability!